80 years now, how about letting us do your dirty work? company for one of our major clients and overnight doubled the size of our operation. 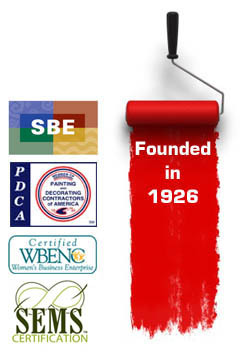 office furniture painting; and custom cabinetry finishes. commercial wall covering, water damage drywall abatement and repair work. of "Preferred Supplier” by several Tri-State companies. CCTSC graduate with over 30 years industry experience. Council & National Association of Women in Construction. Chapter of the Community Associations Institute. sanding, power grinding, chemical peel and priming. and conventional air assisted methods. Coatings from simple latex & enamels to epoxies & catalyzed coatings. Surface preservation and corrosion protection plans. Pressure washing and pressure blasting. Garmat Cabin-Style, Downdraft spray booth & prep station. Cleaning of offices, restrooms, common areas. Purchasing and stocking restrooms and cleaning supplies. Task-specific labor and specialty project cleaning.